Imagine that you are admitted to a hospital and acquire a healthcare-associated infection (HAI) due to the same bacteria that is causing an infection in a patient in a neighboring room. And to make matters worse, the HAI is due to a multi-drug resistant organism (MDRO). What happened? Could it have been avoided? Contact Precautions (CPs) are often used in the care of patients colonized or infected with resistant bacteria in order to prevent events like the one described in this hypothetical situation. Contact precautions require healthcare workers (HCWs) to wear gowns and gloves when entering patient rooms to provide care. Contact precautions were first recommended by the Centers for Disease Control and Prevention (CDC) in 1970 , at a time when there was minimal surveillance for HAIs, few single-bed hospital rooms, very poor compliance with hand hygiene, no use of alcohol-based hand rubs, no chlorhexidine bathing to decolonize patients, and no enhanced technology for environmental disinfection [2,3]. Over the ensuing decades, more knowledge has been acquired about strategic approaches to infection prevention. Despite the widespread use of contact precautions, there is little evidence to support effectiveness in the prevention of methicillin-resistant S. aureus (MRSA) or vancomycin-resistant Enterococcus (VRE) (e.g. of MDRO) infections in endemic settings. In addition, questions have been raised regarding the impact of contact precautions on care delivery and patient safety. In this review, we analyzed 14 studies that described hospitals’ experience in discontinuing contact precautions for multidrug-resistant organisms, including methicillin-resistant Staphylococcus aureus (MRSA), vancomycin-resistant enterococci (VRE), Clostridium difficile, and extended-spectrum beta-lactamase producing Escherichia coli (ESBL-E. coli) in the acute care setting. We found no increase in infection rates in those hospitals after discontinuation of routine use of CP. Most of the studies examined the use of CP for preventing transmission of MRSA and VRE. Different hypotheses could explain our results and should be explored in future studies. One of them is that CPs are not effective at preventing endemic MRSA and VRE infections, and thus discontinuation of CPs does not change the rates of these infections. Currently, a growing number of US hospitals are rethinking contact precaution practices principally for patients colonized or infected with MRSA and VRE and focusing resources on “horizontal” infection control strategies to prevent multi-drug resistant organisms. These strategies are applied to all hospitalized patients, rather than so-called “vertical” strategies such as CP that are applied only to those patients carrying an MDRO. Horizontal strategies include hand hygiene, bare below the elbows, chlorhexidine bathing, care bundles, and environmental hygiene . Our analysis demonstrated that these hospitals are not seeing immediate increases in infection rates, or indeed may be seeing reduced infection rates, without the use of gowns and gloves on entering patients’ rooms. Unintended consequences associated with contact precautions have been well documented as decreased time spent with patients, delays in transfer of patients between inpatient units, excess attributable length of stay, increased readmission rates, as well as patients’ perception of poor quality of care. On the other hand, the best current evidence to support the use of CP for MDRO control in the endemic setting is from the Benefits of Universal Gown and Glove (BUGG) use study, a cluster randomized trial in 20 ICUs that compared CP for all patient encounters to standard care . The investigators found no difference between intervention and control units in the primary outcome of MRSA and VRE acquisition events combined. However, they found that the intervention units had a statistically significantly higher reduction in MRSA acquisition events (an incremental reduction of 2.98 events/1000 patient days). The BUGG study found a decrease of 1 MRSA acquisition for every 336 patient days of the universal CP intervention. Given that there were 4 room entries per hour (96/day) in the intervention arm, and given current best assumptions regarding the number of acquisition events due to transmission and the number of acquisitions that result in infection, over 500,000 “protected” (gowned/gloved) encounters are likely to be necessary to prevent a single MRSA infection. Thus, even if CP were effective in preventing MRSA transmission in the endemic setting, it is unlikely we will see a trial large enough to demonstrate an impact on an infection outcome. Hand hygiene is the most important way to reduce the transmission of microorganisms from one person to another or from one site to another on the same patient. If HCWs ignore this most important concept, they will put patients at risk for acquiring infections in the hospital setting and facilitate the dissemination of different organisms such as MDROs. 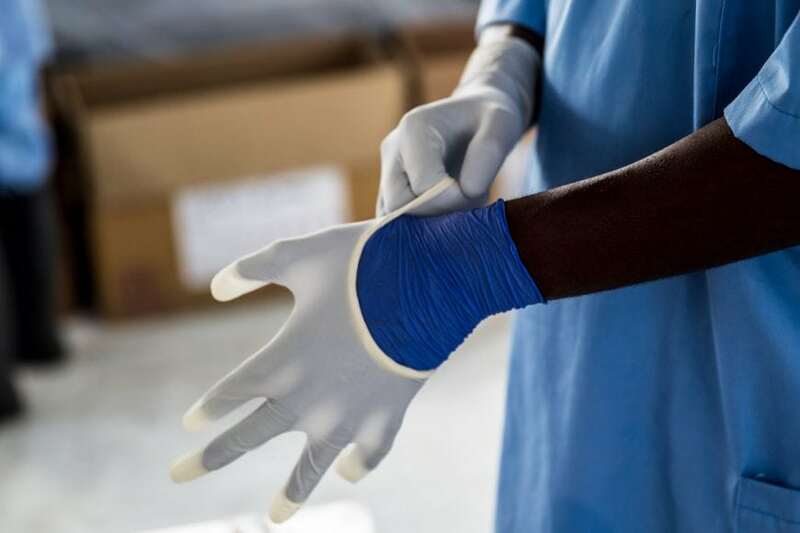 Gloves must also be changed between patient contacts, since many studies show that they become contaminated with MDROs. Sometimes, it is necessary to change heavily contaminated gloves while caring for a single patient to prevent cross-contaminated of body sites or if contamination of portable equipment is likely to occur. Such contaminations may contribute to the spread of pathogens known to survive on fomites, such as VRE and Clostridium difficile. We believe that the discontinuation of contact precautions (as currently practiced) for MRSA and VRE can be safely accomplished, particularly in hospitals with strong horizontal infection prevention strategies, including high levels of compliance with hand hygiene. These findings are described in the article entitled Discontinuing contact precautions for multi-drug resistant organisms: A systematic review and meta-analysis, recently published in the American Journal of Infection Control. This work was conducted by Alexandre R. Marra, Michael B. Edmond, Marin L. Schweizer, and Daniel J. Diekema from the University of Iowa Hospitals and Clinics, Grace W. Ryan from the University of Iowa College of Public Health. Alexandre R. Marra is also from the Hospital lsraelita Albert Einstein. Siegel, JD, Rhinehart E, Jackson M, Chiarello L, the Healthcare Infection Control Practices Advisory Committee. 2007 Guideline for Isolation Precautions: Preventing Transmission of Infectious Agents in Healthcare Settings. http://www.cdc.gov/hicpac/pdf/Isolation/Isolation2007.pdf Accessed 12/05/2016. Wenzel RP, Edmond MB. Infection control: the case for horizontal rather than vertical interventional programs. Int J Infect Dis 2010;14(S1):S3-S5. Edmond MB, Wenzel RP. Screening inpatients for MRSA—case closed. N Engl J Med 2013;368:2314-5. Harris AD, Pineles L, Belton B, Johnson JK, Shardell M, Loeb M, et al. Universal glove and gown use and acquisition of antibiotic-resistant bacteria in the ICU: a randomized trial. JAMA 2013;310:1571-1580. Alexandre R. Marra (Alex Marra) is medical doctor (Infectious Diseases) at Hospital Israelita Albert Einstein, Sao Paulo, Brazil. He is a graduate of Faculdade de Ciencias Medicas de Santos, at Santos, Sao Paulo, Brazil (MD). He completed internal medicine/infectious diseases residency at Universidade Federal de Sao Paulo (UNIFESP/EPM). He completed a master science and doctoral post-graduation, also both at Universidade Federal de Sao Paulo (UNIFESP/EPM). He then completed his post-doctoral in hospital epidemiology at Virginia Commonwealth University (VCU, Richmond, VA) with Dr. Mike Edmond. His areas of research focus on the epidemiology of healthcare-associated infections. Michael B. Edmond, MD, MPH, MPA, is the chief quality officer and associate chief medical officer for University of Iowa Hospitals & Clinics and clinical professor of infectious diseases at the University of Iowa Roy J. and Lucille A. Carver College of Medicine. He previously served as the Richard P. Wenzel professor of internal medicine, chair of the Division of Infectious Diseases, and hospital epidemiologist at Virginia Commonwealth University in Richmond, Va.
Dr. Edmond’s areas of research focus on the epidemiology of health care-associated infections and the public policy implications of infection prevention. I am an infectious diseases physician, clinical microbiologist, and hospital epidemiologist at the University of Iowa Healthcare. I am interested in healthcare associated infection prevention, and the role of the diagnostic microbiology laboratory in supporting infection prevention activities.